Subway station below Hunter College in the Upper East Side. The MTA wants to build new entrances for the station. UPPER EAST SIDE — Residents from an elegant stretch of East 69th Street are outraged over MTA plans to add subway entrances for the overcrowded 68th Street station on their landmarked block. They fear that the subway entrances on the Lexington Avenue line — expected to be built next year — would mar the character of their quiet, leafy street, bringing noise and possibly crime. 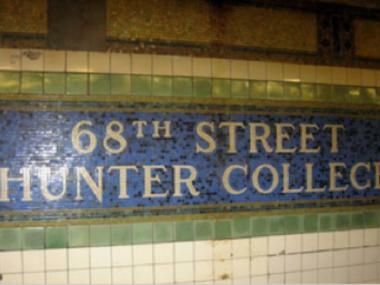 The MTA is planning to renovate the station at 68th Street/Hunter College as part of a federal requirement to comply with the Americans with Disabilities Act, according to a presentation made at a Community Board 8 transportation committee meeting on Wednesday night. An elevator would be added to the northeast corner of 68th Street and Lexington Avenue, and new entrances (just with stairs) would be built on the southwest and southeast corners of East 69th Street and Lexington Avenue. “It would ruin the fabric of the neighborhood,” East 69th Street resident Nancy Friedman told DNAinfo. “It’s the most beautiful block in the city,” she claimed, describing her street’s carriage houses and townhouses. Particularly on the west side of the street, the entrance wasn't needed, she said, because "people to the west don't take the subway. Not to be elitist, but they don't." Community Board 8 will put the MTA’s presentation online and solicit responses to provide the MTA. The transportation authority is expected to come back in December with an updated plan. But CB 8 member Teri Slater took umbrage at those remarks. “This is not an elitist argument,” said Slater, who believes that there is simply more crime concentrated around subway entrances. She didn’t think there was a “mandate” for the new entrances on East 69th Street and thought the MTA should redesign the plaza on East 68th Street in front of Hunter College to increase the size of the entrance instead. “There’s a fundamental disconnect between the MTA and the neighborhoods of the Upper East Side,” she said. That disconnect began to rear its head, she said, with the Second Avenue subway, which has turned swaths of the neighborhood into a giant construction zone.